A bit of an archaic term, but still a wonderful building. 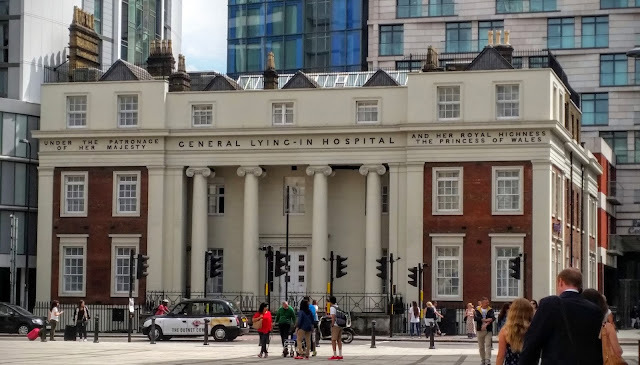 Considering the amount of regeneration around the South Bank, especially close to the old County Hall and its environs, I am still amazed that wonderful buildings like the General Lying-In Hospital still survive. Although no longer a hospital it is still part of the Guy's and St. Thomas' NHS Foundation Trust, who use it as offices and a training facility. The Westminster New Lying-In Hospital opened in 1767, but was deemed to small to keep up with demand. So, in 1820, new land was purchased and construction of this building began. In 1828, the first child was born in the premises, which were duly incorporated in 1830 as the General Lying-In Hospital. A thorough revamp of the building was carried out, in 1879, which included new ventilation and new drainage systems. New store rooms were constructed, in the basement, while a new ward was also added. A training school for midwives was also created, which saw two additional storeys added to each wing, to accommodate the trainees. The midwifery training school was something that Florence Nightingale took a keen interest in. This hospital was the first to practise antiseptic midwifery in the country, in 1880. During World War II the hospital was moved to St. Albans, Hertfordshire, returning to London in 1946. The hospital finally closed in 1971, after having delivered some 150,000 babies.